… the planning and design software for professional users! With its simple and easy to use features, cadvilla professional combines all user capabilities with the highest design standards. 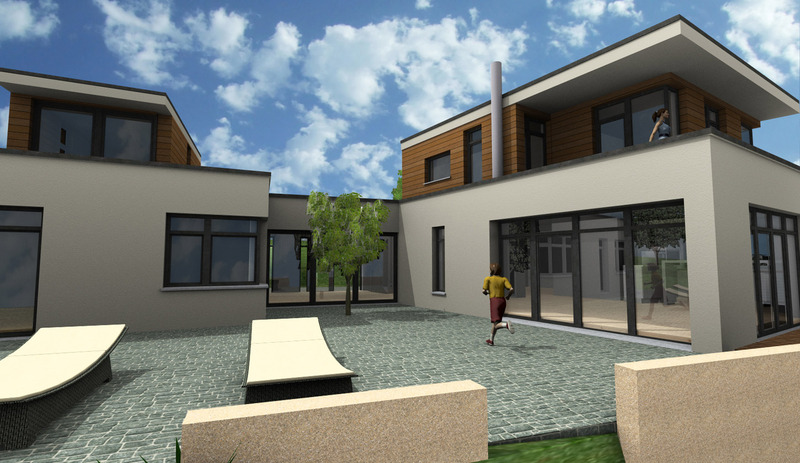 Views and sectional views can be generated as required and can be automatically included in an overall plan view. The optimized function for plan layout avoids discrepancies between projects and plan since all details resulting from views are based on the complete project data. Any design object or light sources, which are available for example in 3DS or ACO format, can be imported, integrated, modified, or even created new according to your own requirements. 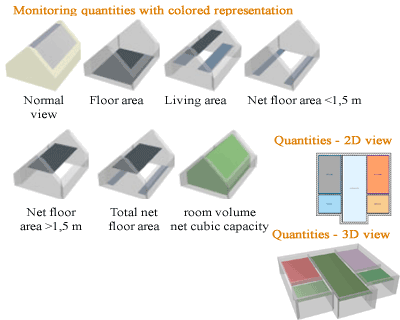 The calculation of areas and quantities for room data sheets automatically take into consideration the specified building standards for determining the living area of your building project, and not only describes the living area in list form, but also shows it clearly and in an understandable way in color and in 3D. Plans in 2D DXF/DWG format can be imported and processed in 3D, and a function for importing projects from ArCon open is also included. 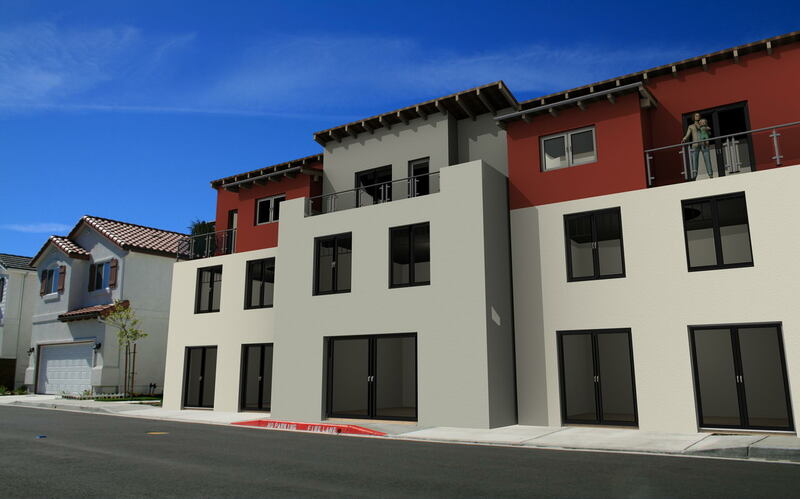 These properties are indispensible for plan layout, for submitting building applications and especially for detailed and comprehensible presentation to your clients. You can find a detailed comparison of the functions provided by the various versions in the menu under Products - Compare Versions. The Import of “ArCon (planTEK open) projects“ is part of “cadvilla professional“. cadvilla Tutorial is also part of cadvilla professional. All versions of cadvilla - cadvilla basic, cadvilla basic plus, cadvilla professional and cadvilla professional plus - are fully compatible to one another, so that data produced in one version can always be used in any other version. Additionally, the user language displayed by the cadvilla architecture software can be configured by means of a simple setting in the menu. Therefore, it is possible to switch quickly between various languages. The languages currently provided are English, German, French, Spanish, Italian, Dutch, Russian, Polish, Slovakian and Hungarian. 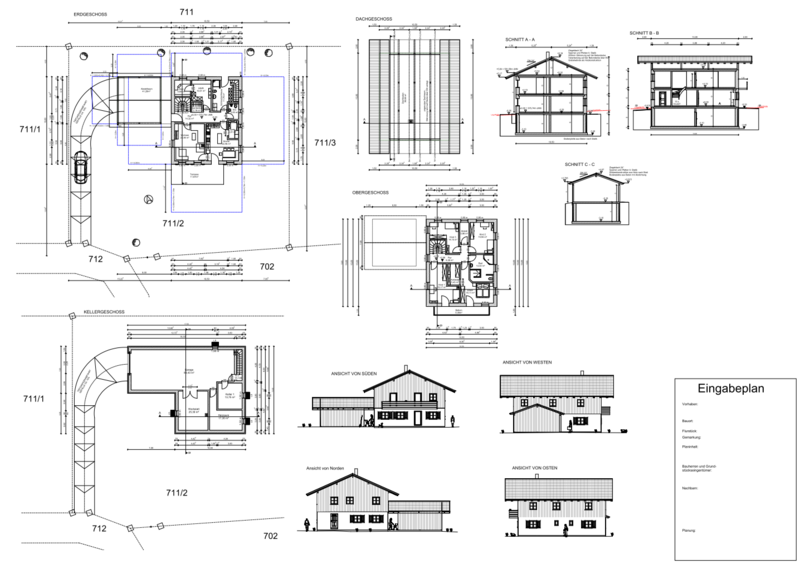 The plan layout module provides functions for the layout, design and display of plans and drawings to scale. 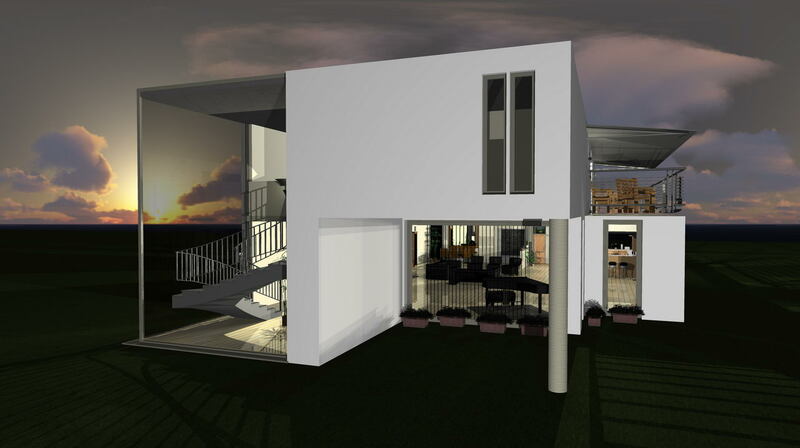 Plan layout uses the current project data and construction details directly without being separated from the building model. All modifications to the design are automatically updated in the plan layout since all data is based on the project model. 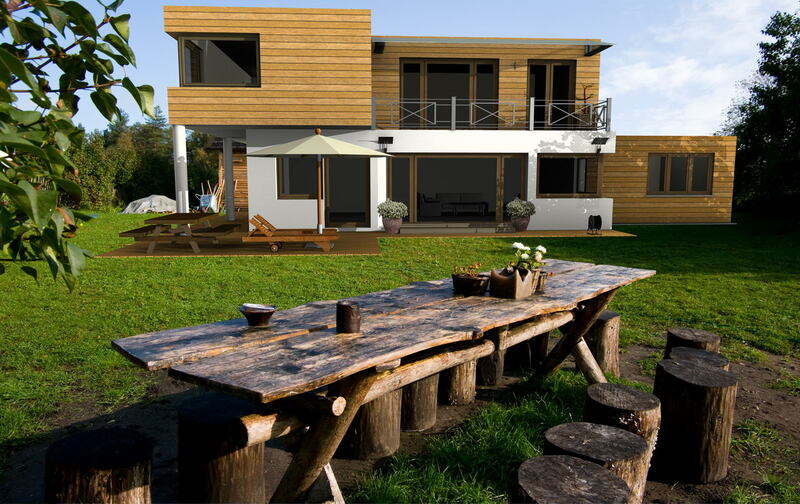 This ensures there are no discrepancies between project model and plans. - The third step is to add 2D symbols, 2D graphic elements and images, which are provided or which you have created. 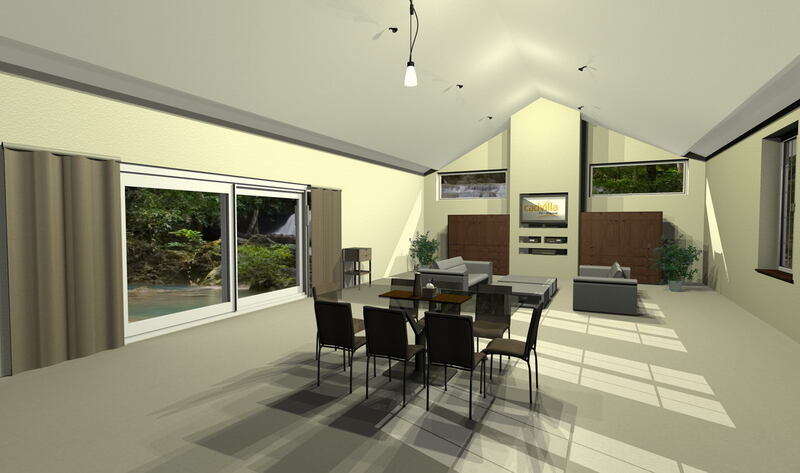 Images can be photos but also the results of visualizations from 3D views of your project. 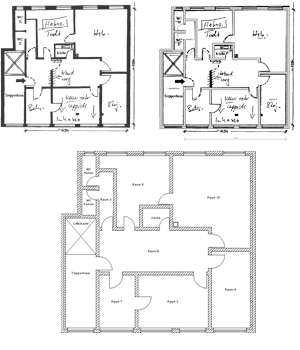 Creating a plan layout is that simple! 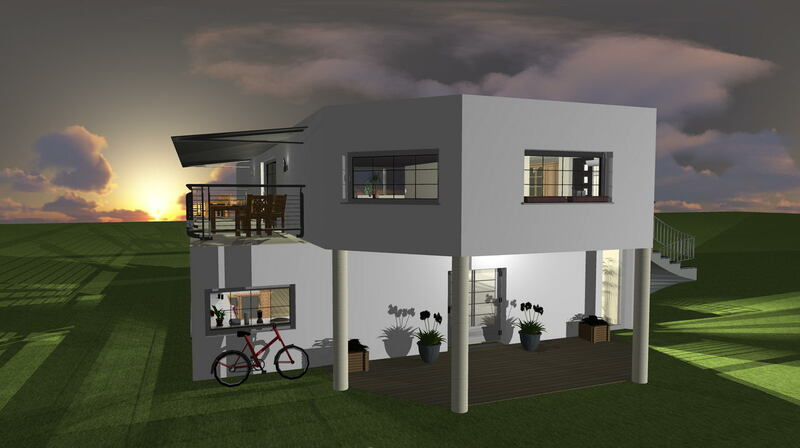 Apart from providing other options for construction in addition to the predefined building components, 3D construction allows the user to design his own 3D objects for the object catalog and thus extend the catalog as required. The objects are formed by combining 3D elements, known as solids. There are four different types. 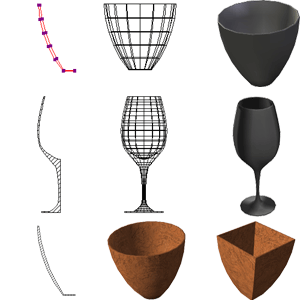 - Primitives: Basic predefined solids e.g. cube, cylinder, pyramid. - Extrusion solids: Created from a closed 2D contour for which a height is specified. - Rotation solids: Created from a closed 2D contour that rotates around a specified axis. - Sweep solids: Created from a closed 2D contour which follows a defined path. The solids that have been created can be edited with other functions such as merging and uniting, or using Boolean operations, while being combined to form new 3D objects. 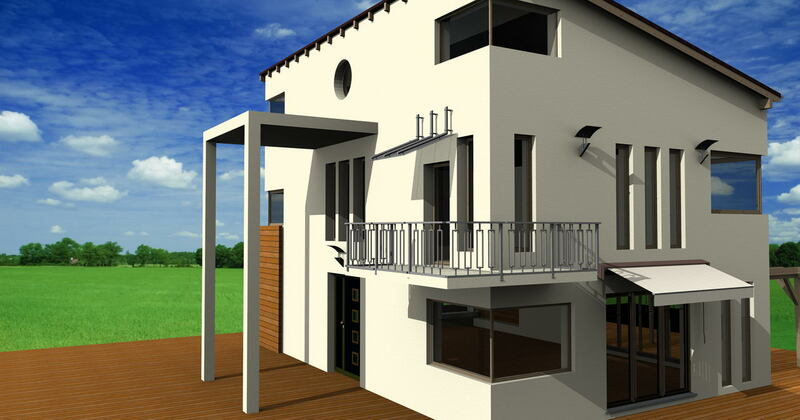 Examples of applications for the use of 3D constructions to create objects are carports, terrace roofs, balconies, lattices, rose arches and plant pots, and many more. The name implies that subtraction solids are intended for subtracting from other solids using Boolean operations (intersection algorithms). 'Cube' and 'Plane' are provided as standard subtraction solids, but it is also possible to use other subtraction solids. Other subtraction solids are the result of converting existing 3D constructions into subtraction solids. Subtraction solids are not intended for use in modeling. For modeling, other mechanisms such as Boolean operations are provided. 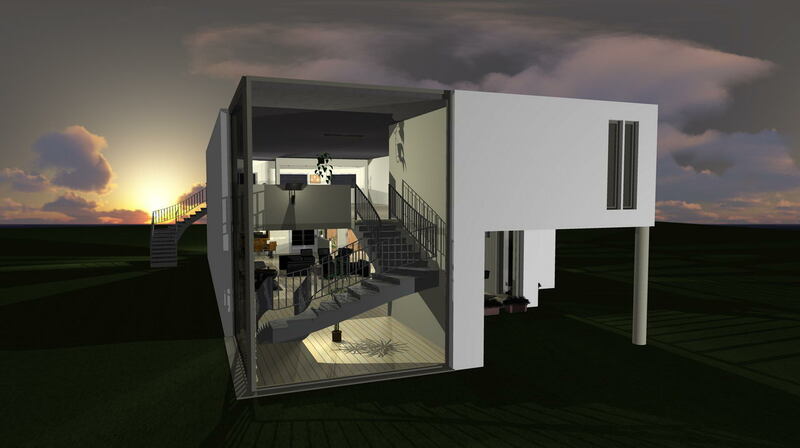 In the example shown the cube was subtracted from all layers of the building. In the view on the left the cube is still visible, while on the right it is set as invisible in the visibilities dialog. The cut-out representation, however, has no effect on the 2D representation in the top view. In the example shown all constructions in front of the plane were subtracted from all layers of the building. The direction of input of the subtraction solid can be defined over the context menu. In this example the subtraction solid is equivalent to the excavated part of the terrain. 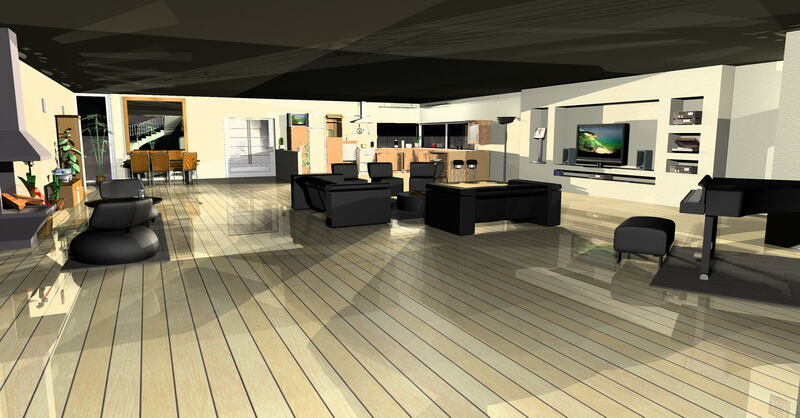 Apart from the 3D display, the result is also shown in views/sectional views and top views. 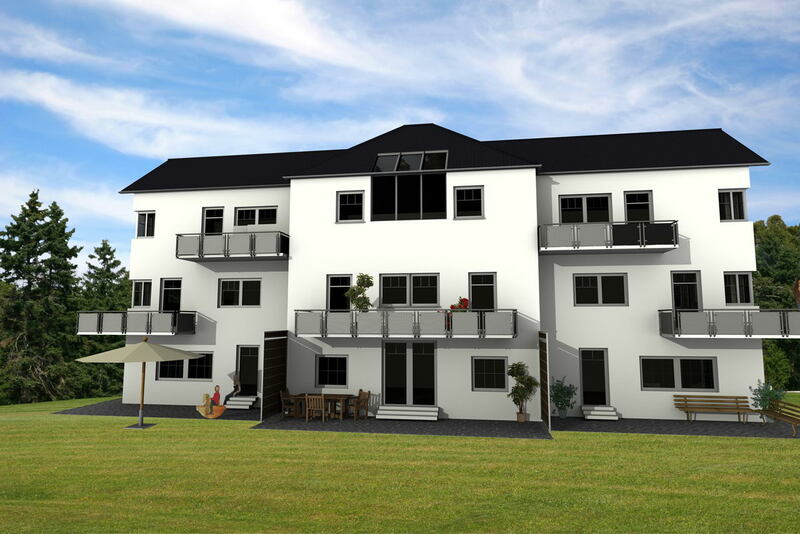 Additional examples for the use of subtraction solids are access ramps, roof terraces and many more. You can set the scope of the subtraction in the properties dialog for a subtraction solid. Here you can specify which types of construction element and which layers are affected by the subtraction solid. This function is particularly useful for adding light sources to existing and new objects. Ambient light sources illuminate all areas of a scene equally and therefore increase the overall brightness. However, they do not create shadows. 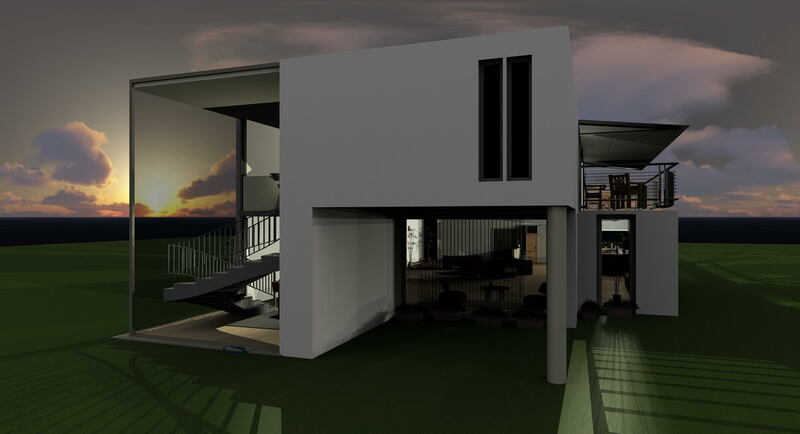 Directional light sources illuminate a scene from only one direction and are 'internally' infinitely distant from the location of the observer/building. The sun is an example of a directional light source. Punctual light sources have a defined position within a given object and are therefore the closest display of real lamps for interior decoration. The scene is illuminated in all directions around the light source. As with punctual light sources, spots have a specific position within the given object and therefore also represent real lamps. However, in this case the light does not emanate in all directions as it is the case with a punctual light source, but instead in a light cone with a beam angle and aperture angle. 'Walkthrough' mode can be activated in an active 3D view. In this mode, direction and inclination are controlled by movements of the mouse. The mouse wheel can be used to change the height of the viewing position. You can control forward and sideways movements by default with the arrow keys. Other key combinations and further options can be specified in the 'walkthrough' dialog. If you press the SHIFT key during a movement, movement of the adjustable factors are accelerated. 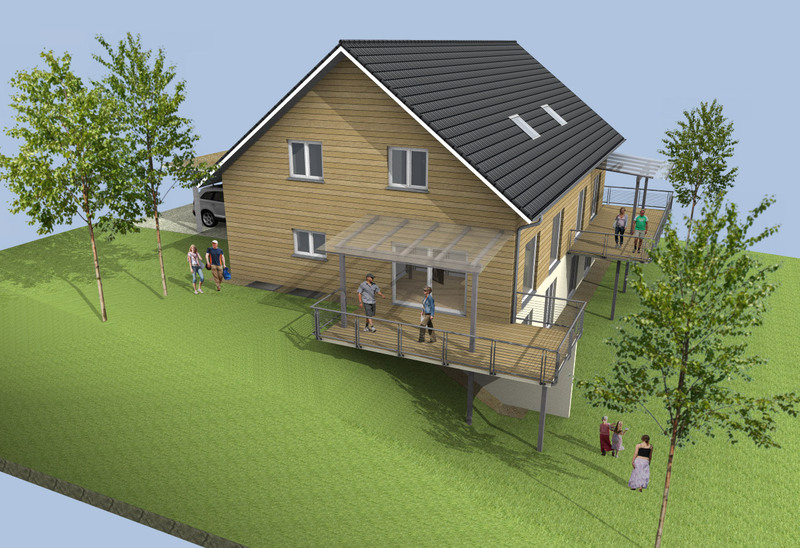 The mass determination also provides the possibility to create room data sheets for defining a living space according to the German living space ordinance (WoFlV), and the calculation of room cubic capacity according to German DIN 277. - PDF (Portable Document Format) - is the standard format for documents and can be displayed with freeware software programs such as the Adobe Acrobat Reader. 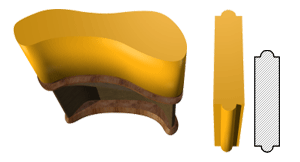 3D objects can consist of several sub-objects which form an item. 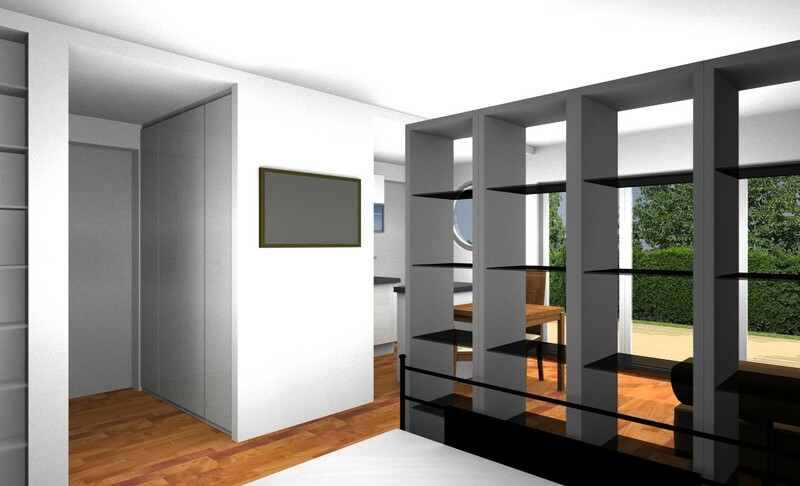 A kitchen unit, for example, could consist of a cabinet, a draw and the draw-handle. By deactivating the draw-handle and changing the draw to invisible, a new object can be created and then saved. Alternatively, the existing draw-handle could be deactivated and replaced with a different one. Therefore, the possibilities for creating new objects are almost unlimited. This function allows you to load in existing projects (*.acp) based on ArCon [planTEK] or ArCon open, and to further process them in cadvilla. Additionally, ArCon projects can be taken over up to version 6.30. 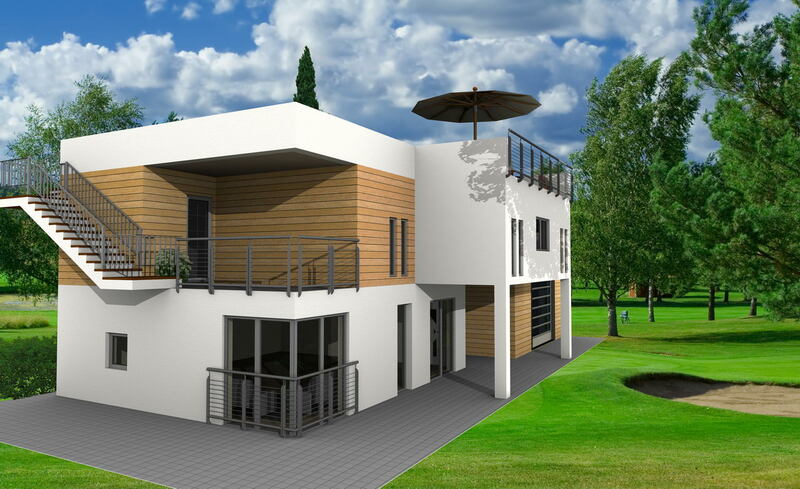 Ideally, the complete project with all walls, ceilings, windows, doors are taken over in 3D and can then be edited, modified and amended with cadvilla. In case you have specific additional CDs with objects for ArCon (file ending *.aco), you can convert them and take them over in the object catalog of cadvilla. Once a file has been loaded, a preview appears in which you can select the contents to be imported. This is achieved by activating or deactivating the particular layer in the layer dialog. After or during import you can modify the scale and the display of lines. The DXF/DWG file is first imported as an element, i.e. as a 2D symbol. 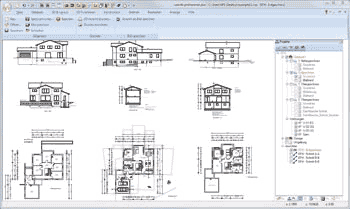 The DXF/DWG import function can be used to migrate architectural plans or to import 2D symbol catalogs. 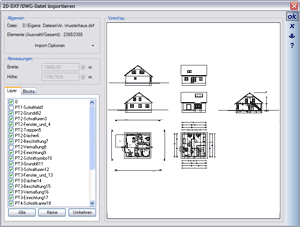 An imported symbol used in a plan can be disassembled into its constituent elements directly in the plan, if necessary, and then be edited and stored in the 2D catalog with the help of standard functions. Once floor plans have been transferred to cadvilla, the imported layers can be used as auxiliary lines, to which, for example, walls will snap. 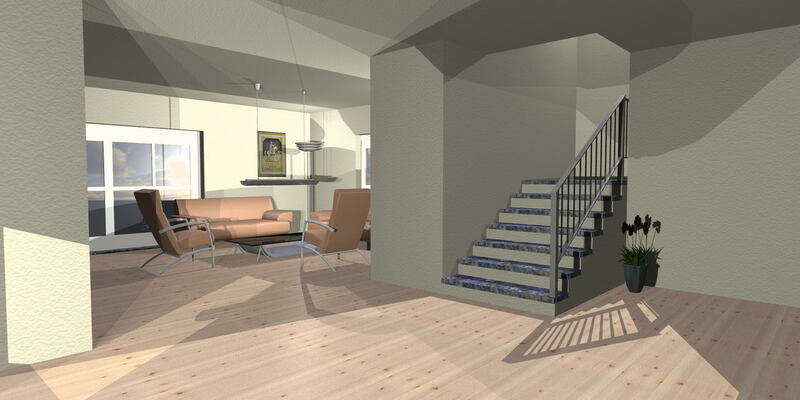 Ray tracing (light and shadow rendering) in 3D views is an important feature of cadvilla. 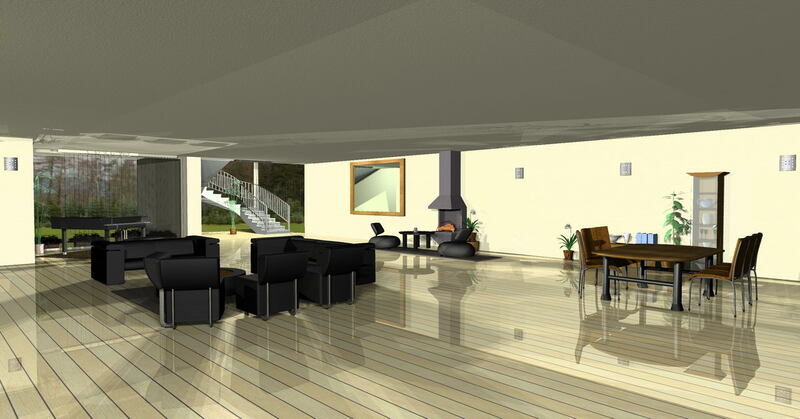 Ray tracing takes into account all visible elements and objects in the scene and their current settings. 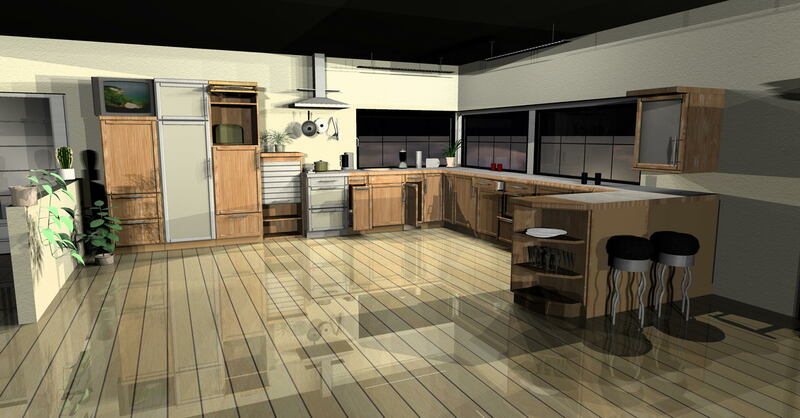 The available settings for ray tracing have a considerable effect on the quality of the representation. These settings include anti-aliasing, smooth shadows and ambient shadows, the intensity which you can specify before ray tracing is activated. 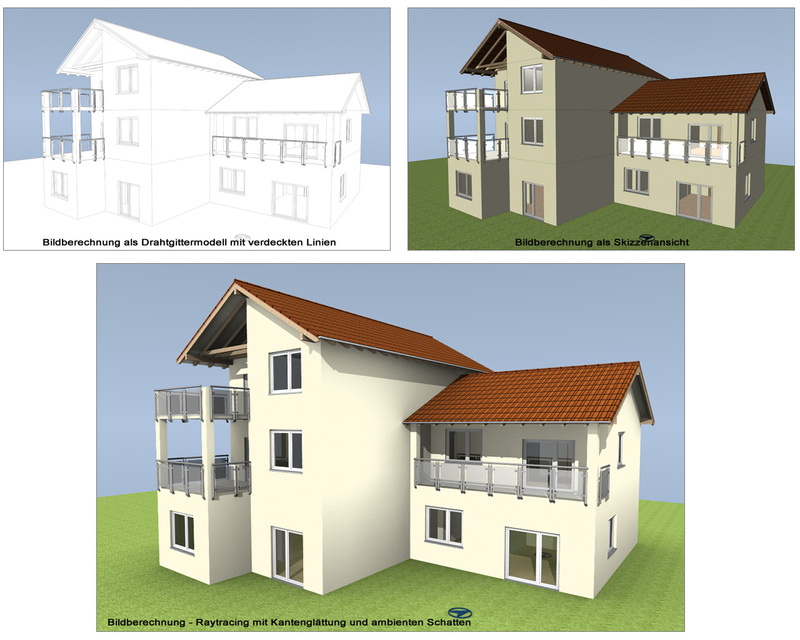 The illustration shows in the top half a 2D view and a sectional view. 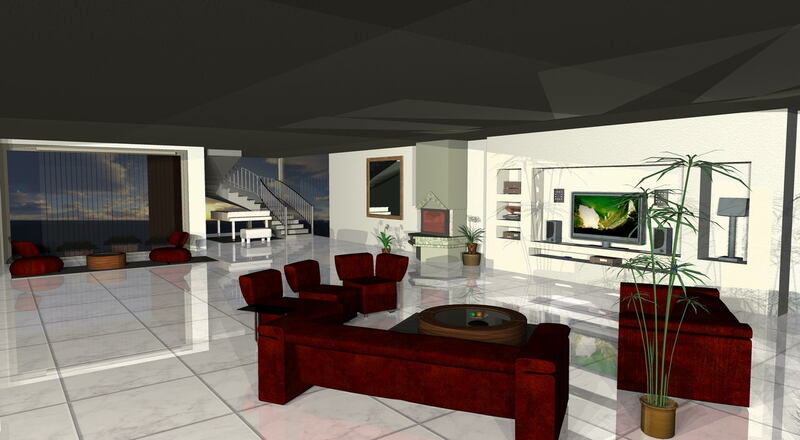 Various sectional views and views with different contents can be displayed and edited simultaneously. The definition of the sectional views is done by using the mouse. First the cutting line is defined and afterwards the direction and the depth of the sectional view using a rectangle. After the sectional view has been defined via the rectangle, the new view is generated and displayed instantly. 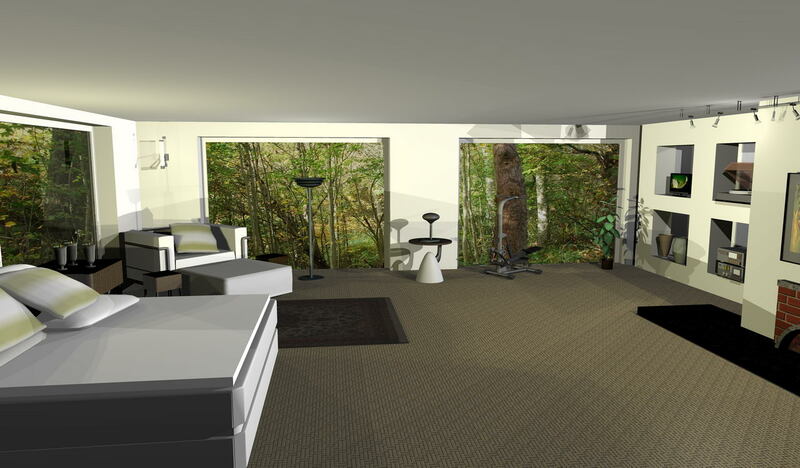 A view is therefore a sectional view that runs across the entire floor plan. 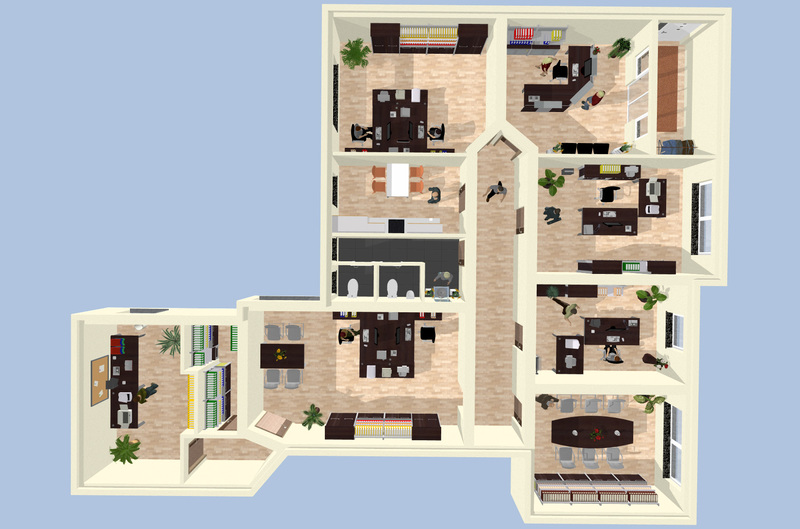 Optionally, you can generate a sectional view with concealed lines. A basic concept of the software is that a change to one view/sectional view is always performed simultaneously in displayed windows. Sectional views and 2D views are not only important because of the display, but also because of the input of wall slots, detailed wall penetrations etc. A 2D graphic view can be created from an active 2D view and its content. This view no longer contains construction components. All content is converted into the 2D graphic elements, i.e. lines, polygons etc. that originally defined the construction components. These 2D elements are no longer linked to the current project. The advantage of a 2D graphic view is that all 2D elements can be edited and, if required, deleted separately. This allows you to perform detailed editing on certain elements of your drawing and then save them as 2D symbols for later use, or delete unwanted elements before printing the plan. Furthermore you can add additional details such as lines, circles, ellipses, dimensions, text, other images (as shown in the example) and much more to 2D graphic views. 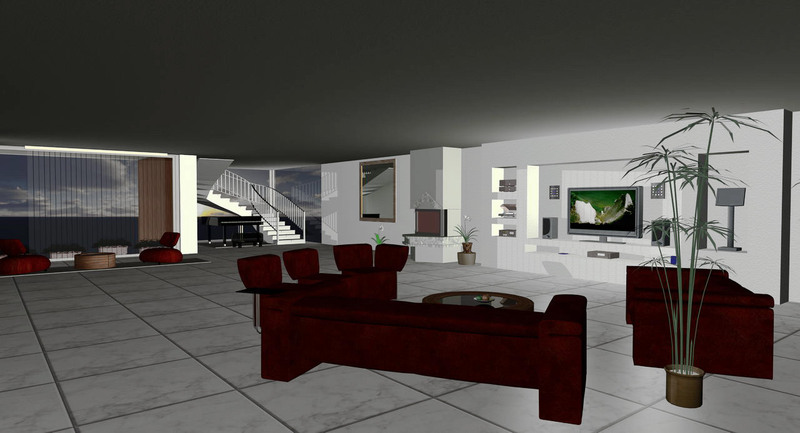 A parallel perspective can be easily created from an active 3D view by positioning the 3D view as required, and while opening it for a new parallel perspective view. 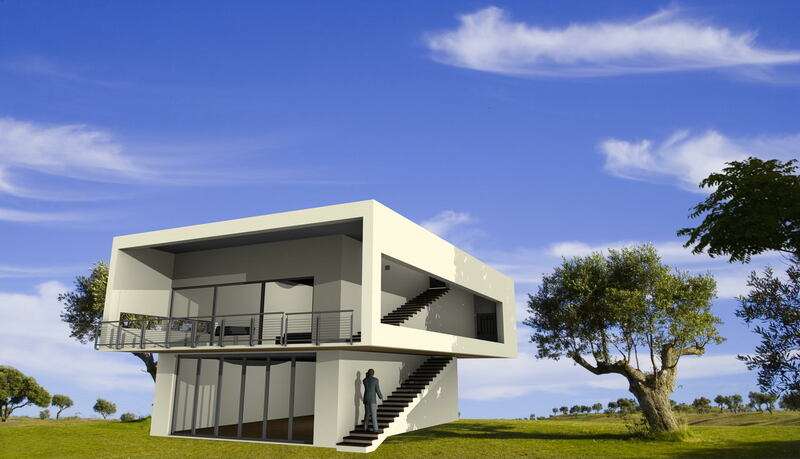 These views are still linked to the construction model and act similar to sectional views. You can thus modify the visibility settings and, if required, influence the display by activating hidden line processing. On the top left of the following illustration a perspective is shown, which was created from the 3D view beneath it. To the right of it you can see another perspective with activated hidden line processing. Exporting 3D formats such as 3DS, 3D DXF etc. By means of visibilities/ visible categories of the 3D view which are supposed to be exported, you can define whether the complete view or only certain parts of it should be exported as a 3D object. Therefore, you can save not only individual results, e.g. 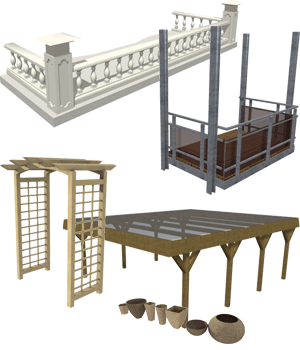 a roof or a staircase, for further use in other programs, but you can also extend your own catalogs via the export as a 3D object. Apart from settings for visibility and once the file name of the object to be saved has been specified, you are also provided a range of options that affect among other things the way an object will act later. 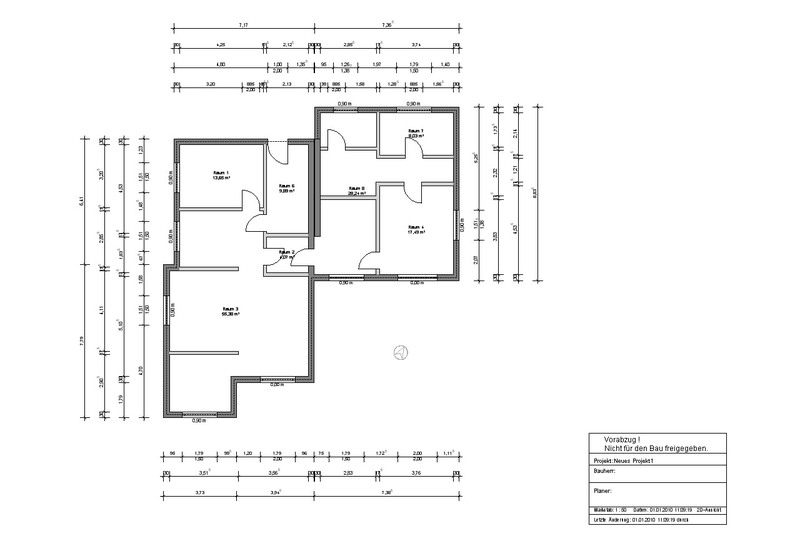 The program allows you to create any complex scaled floor plans. Grids, auxiliary lines, and options for numerical input are provided for input purposes. Additionally there is a context menu providing construction aids in order to capture data. They are particularly helpful for constructing with the help of a midpoint, an intersection point, a point at a distance of, a perpendicular, a parallel point, and a point in line or coordinates. 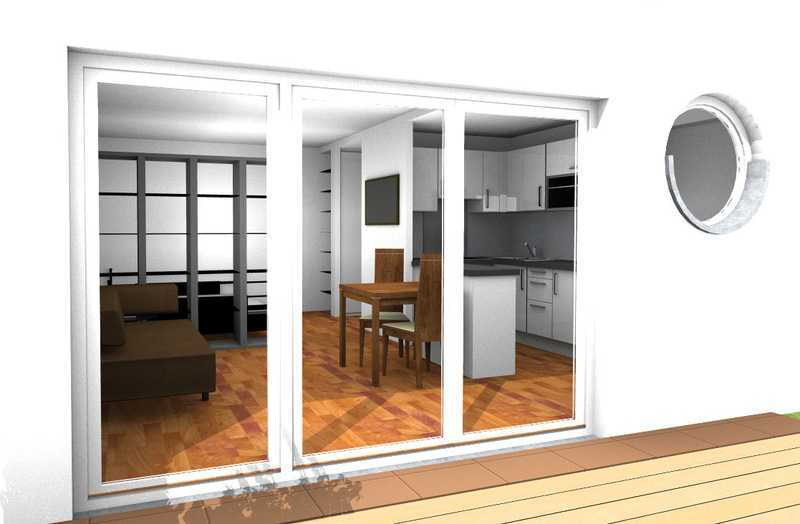 The construction aids are available for all inputs, for example for inserting walls, windows and doors, and they allow you to quickly create a floor plan. Different types of auxiliary lines and input options are provided for 2D plan views and 2D views/sectional views. There is a difference between a straight line and a straight length. Straight lines are 'infinite’, while a straight length has a start and an end point. You will notice this immediately due to the different input options. All types of auxiliary lines can be turned off in any view using the visibility option for construction aids. 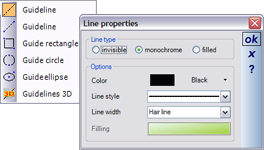 The color properties and style properties can be set for all types of auxiliary lines. These properties can be modified later, and can also be specified when the auxiliary lines are created in the properties dialog which is activated via the context menu opened with a right mouse click. The advantage of doing so, while the auxiliary lines are created, is that they have the right properties automatically, and do not have to be modified later. 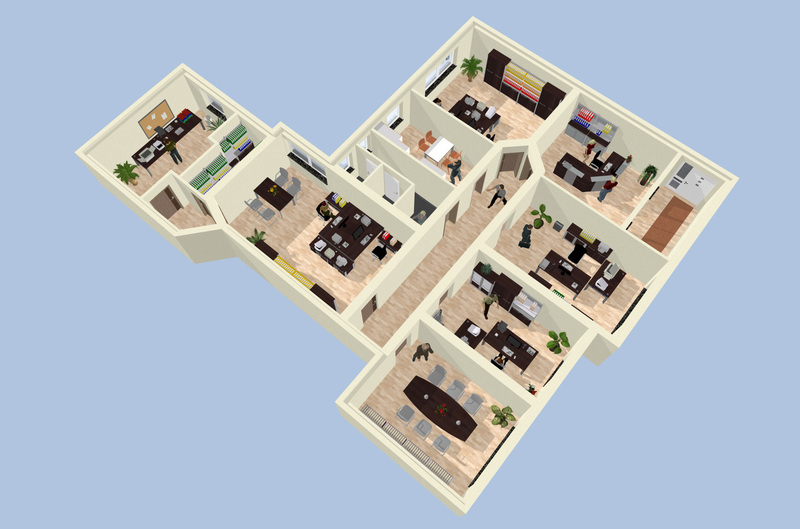 In principal, the software operates based on a 3D model for which various views can be defined. 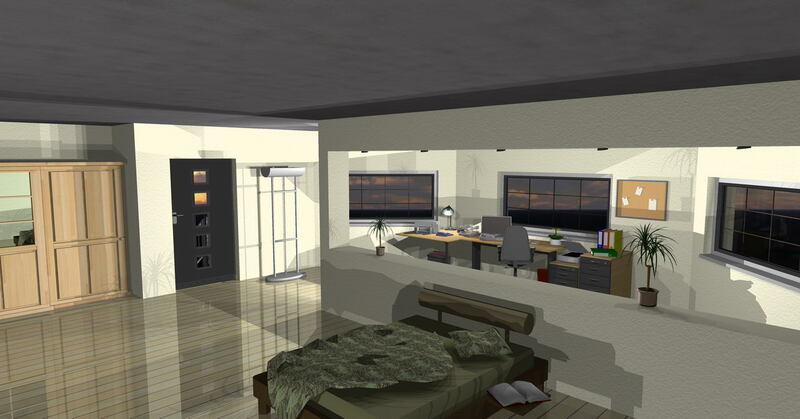 The following illustration shows a 3D perspective view and a 2D plan view. Several windows with different content can be displayed at the same time. Since internally all views are equal, all user actions, e.g. selecting,, positioning, moving etc. are, if applicable, carried out the same way in all views. All views are updated simultaneously so that the user can follow the effects of changes in 3D as well as in 2D. The individual windows can be presented vertically or horizontally tiled, cascaded or in tabbed form. 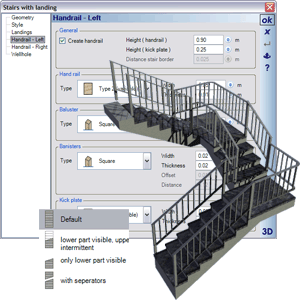 Once you have put in stairs, the program automatically calculates the width and height of the staircase, and based on the step dimensions, a reasonable ratio between rise and tread depth. These values can then be modified in the subsequent input dialog. All stairs can be constructed with a solid or a wooden staircase. Different input fields are provided depending on the construction type. In all staircases handrails can be modified on the right and left. The changes do not only apply to the dimensions of the handrail components, such as 'handrail', posts, steps and base rails,, but also the shape of a component can be selected from a number of predefined shapes. When putting in stairs with landing individual landings are created automatically at each corner of the polygon. A defined minimum distance between landings, defines at which point the software creates stairs between two landings. For the individual display of stairs in the 2D top view you can choose between standard, lower part visible, upper part optionally visible, and display of stairs with separation lines. 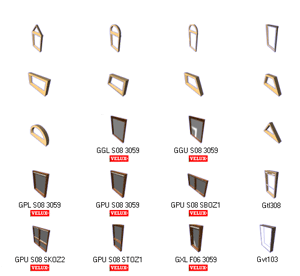 The software offers a selection of various window types. They range from windows with one or two casements, with or without bars to windows with predefined materials and standard windows. If you move the cursor over the plan in the vicinity of walls you can see a preview of the window you put in including the direction of opening. You can position the window by using auxiliary lines or construction aids. Construction aids are particularly useful for constructing via a midpoint, an intersection point, a point at a distance of, a plumb bob, a point with parallel extension, and a point in extension and the input of coordinates. You can specify the width, height, direction of opening, and sill height of the selected window in the properties dialog along with the display of the top view, the opening, the sectional views and the other views. 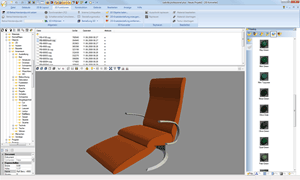 Comprehensive catalogs for objects, textures and materials are a standard feature of cadvilla. The standard catalogs can be upgraded with additional collections from various manufacturers. The surface editor can be used to create 3D surfaces on various planes. Once a plane or surface area (e.g. wall, roof, surface area of an item of furniture) has been selected, a parallel surface area can be created in the shape of a polygon, a rectangle or a parallel plane. In the subsequent dialog for the surface created you can specify the thickness of the surface and the distance from the selected plane. 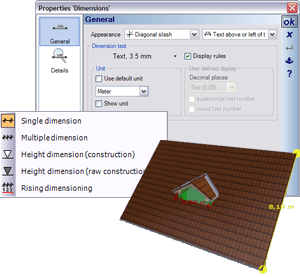 Whenever a surface area is defined, first of all openings such as windows, doors or wall recesses included in or under the surface are detected and shown in the dialog. 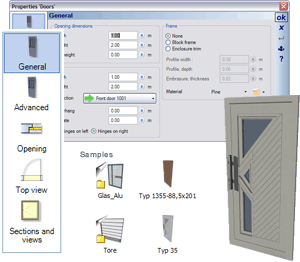 The software offers a large selection of different door types. They range from standard doors to glass doors and gates. If you move the cursor over the floor plan, in the vicinity of walls, you can see a preview of the door you have selected to put it in. You can then position the door with the help of auxiliary lines or construction aids. 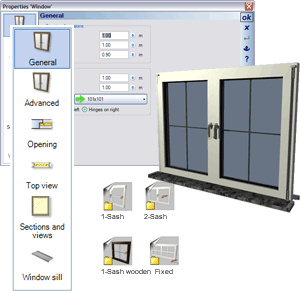 You can specify the width, height, direction of opening, and sill height of the selected door/gate in the properties dialog along with the display of the top view, the opening, the sectional views and the other views. You can also specify these properties as a default for other projects. 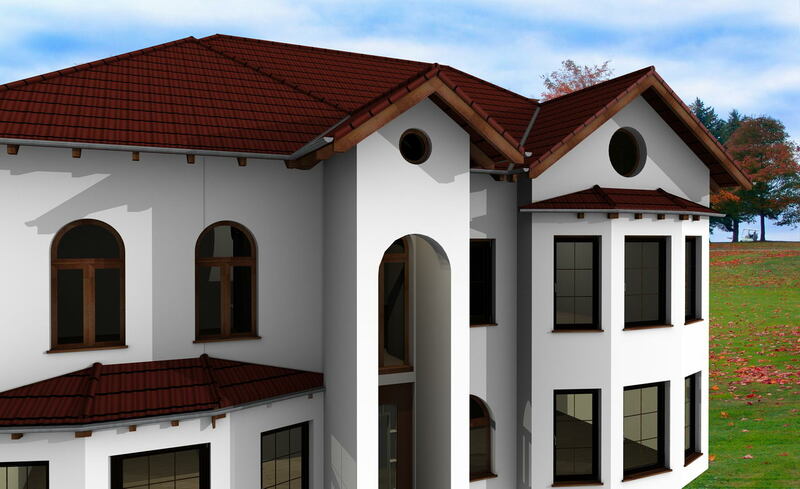 The program allows for the automatic or manual construction of hipped end roofs, gabled mansard roofs, extended gabled mansard roofs, gable end roof, clipped gable roof, and clipped gable roof with a whole, ridged roof, monopitch roof as well as a combination of these roof shapes. 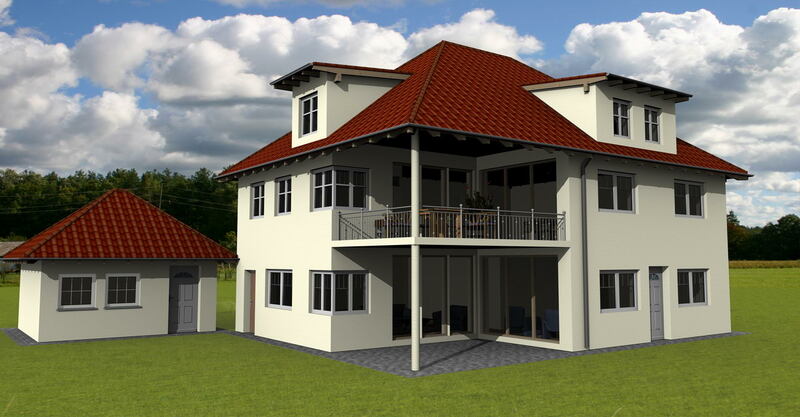 Furthermore, the roofing, timber construction, rafters and details of the gable ends and eaves are automatically constructed once the roof has been defined. 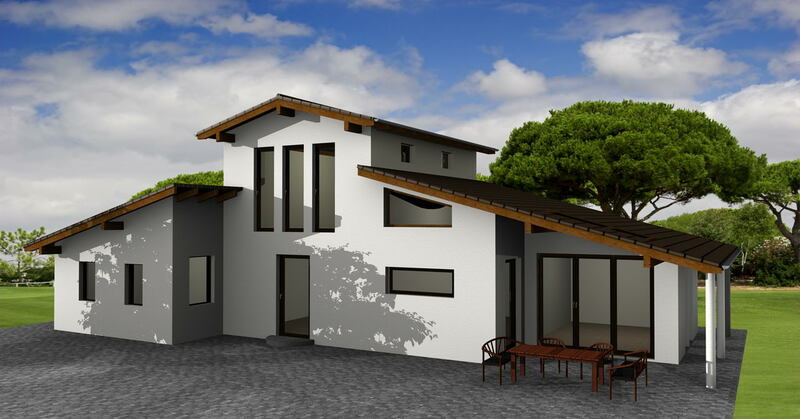 The program automatically makes recommendations for the roof structure, including roofing, timber construction, rafters and details of the gable ends and eaves. 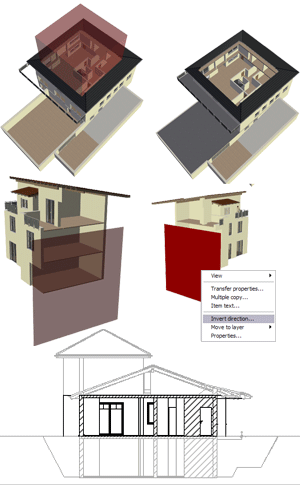 The associated roof editor simplifies the definition of new, complex roof shapes. You can define a profile type, e.g. a gable end roof, a monopitch roof, a hipped end roof, a clipped-gable roof, for each roof area. Depending on the selection, the required parameters are retrieved and explained immediately by a 3D display. The ability to define the attic wall sill and inferior purlins for each roof area is another feature of the roof construction. You can define a particular shape for visible purlin heads from those defined under gable end details. 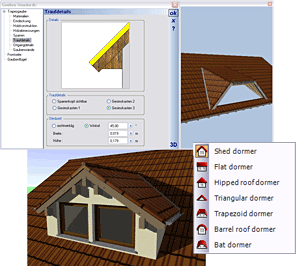 The dormer function allows you to put in various dormer types in existing roofs. Possible dormer types are gable dormers, swept dormers, hipped dormers, triangular dormers, trapezoidal dormers, arched dormers, and eyebrow dormers. Dormers and their walls and framing are fully integrated into the roof. 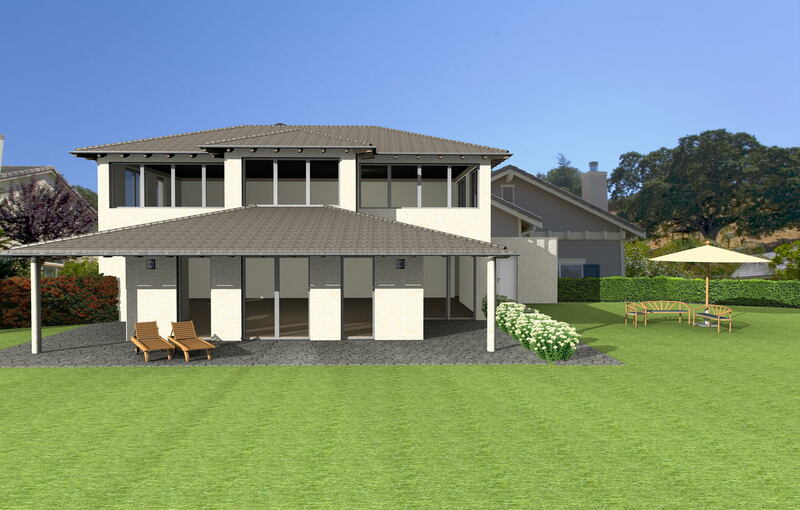 The dormer walls and roof are automatically created when the dormer is defined. 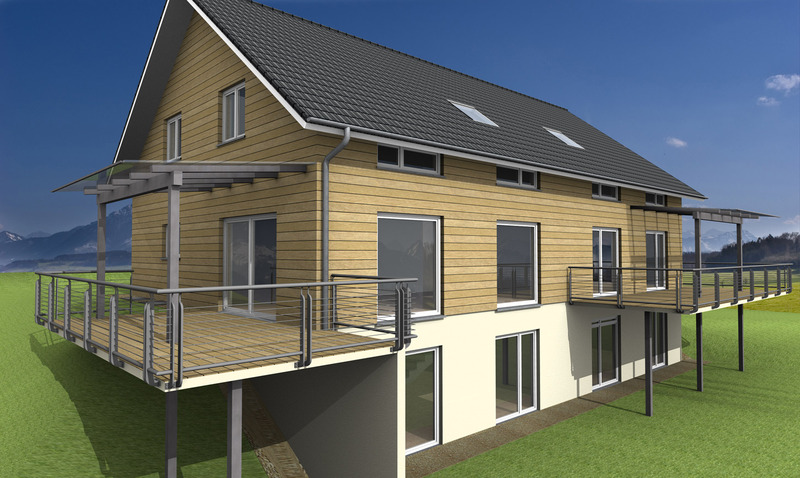 Modifications to the timber construction of the roof are subsequently taken into consideration. The rafters are removed in the area of the roof where the dormer is inserted, and the rafters for the dormer roof are also constructed. 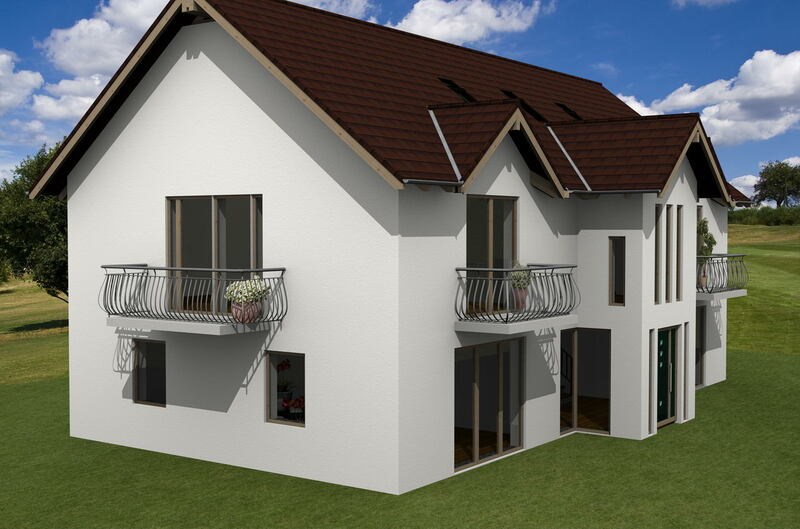 If necessary, you can of course modify and amend the dormer via various settings parameters later. 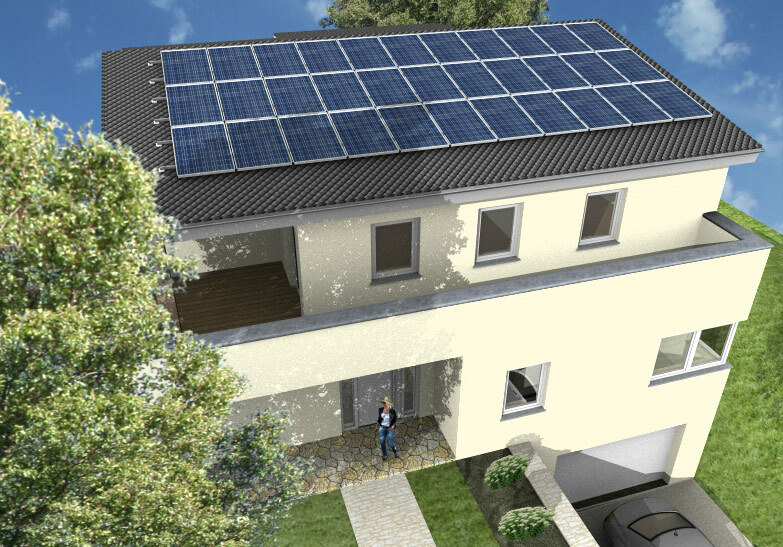 Solar panels and solar collectors can be positioned on roof areas using the normal input functions. 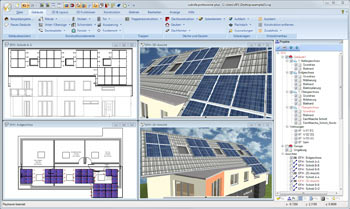 Solar elements perform similar to roof windows, but have additional options in the properties dialog for on-roof mounting or roof integrated mounting. 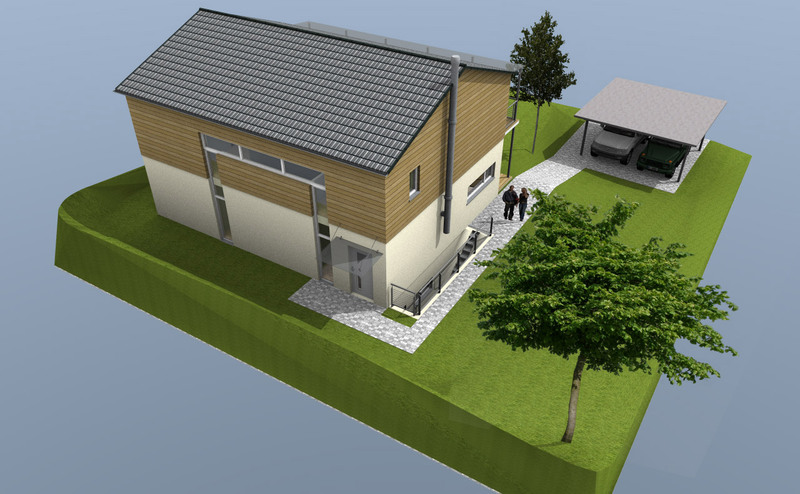 For roof integrated mounting solar elements create openings in the roofing, but not in the roof cladding. In the case of on-roof mounting no openings are created in the roofing. When solar elements are positioned via drag and drop from the catalog they perform like normal 3D objects. 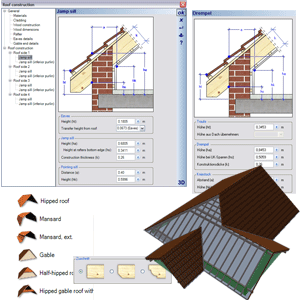 The software provides an extensive selection of roof windows of different types and styles (an extract is shown in the illustration on the right). 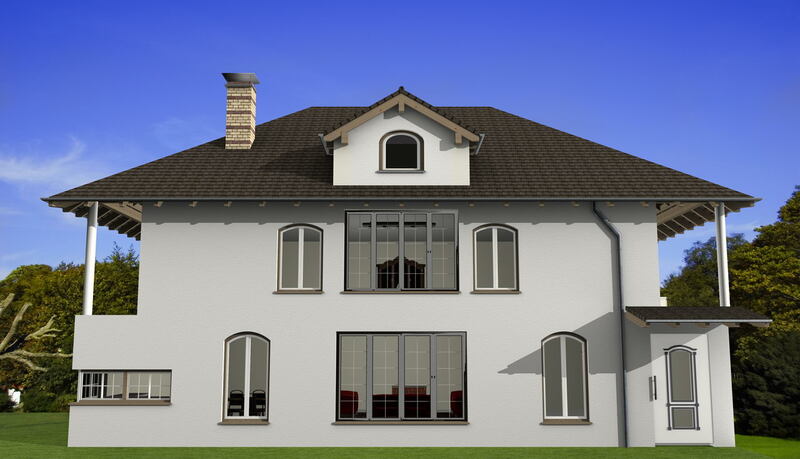 Of course, roof windows from the manufacturer velux ® are represented as well. 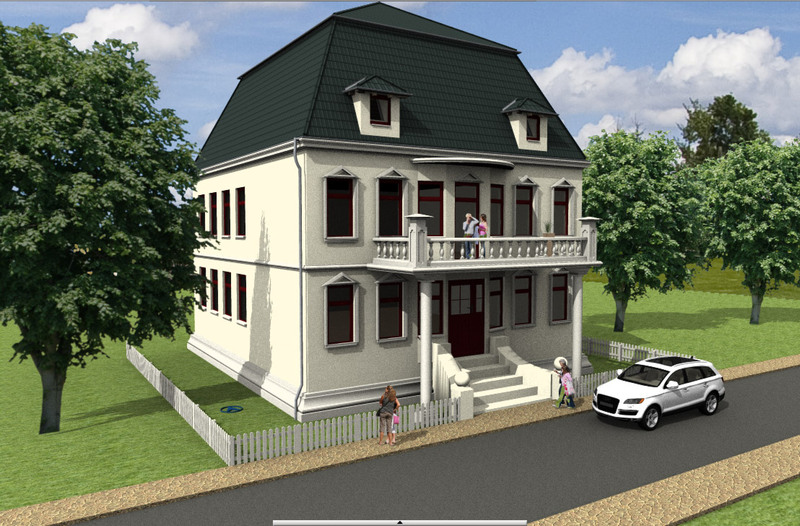 You can add in roof windows in 2D and in 3D views. 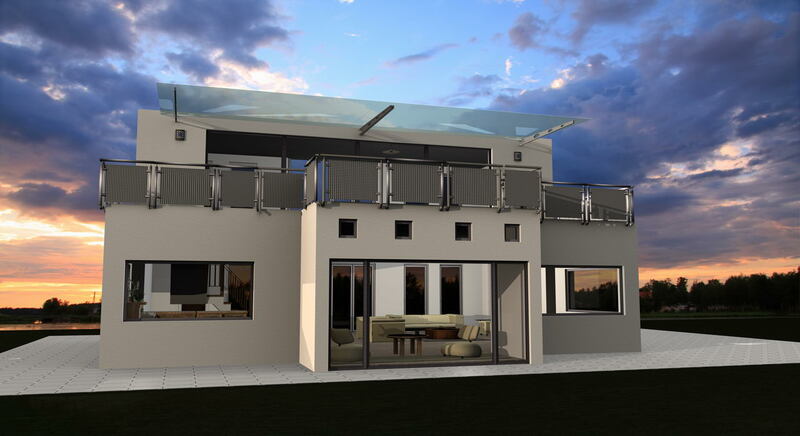 In the process the roof window turns automatically in the direction of the roof side where the window is located, displayed transparently and thus allowing the view to the underlying rooms and timber constructions. 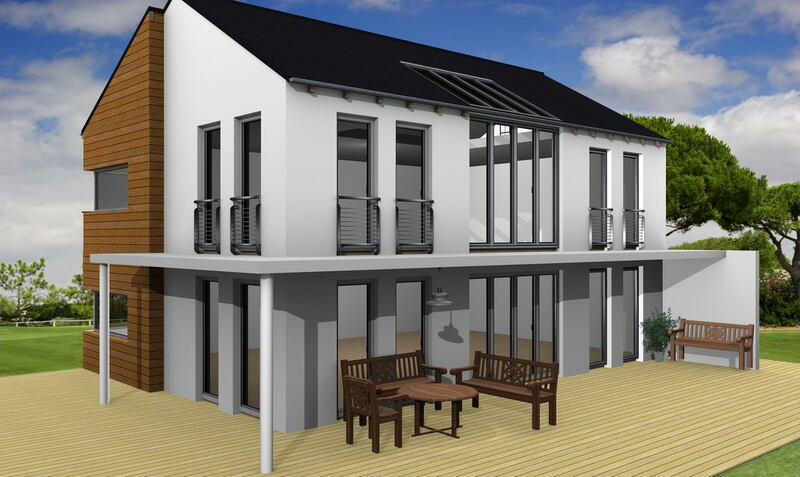 When roof windows are inserted, matching openings in the timber construction are created automatically. The dimensions of the timber for the openings are identical to the dimensions of the rafters specified in the 'Roof' dialog. 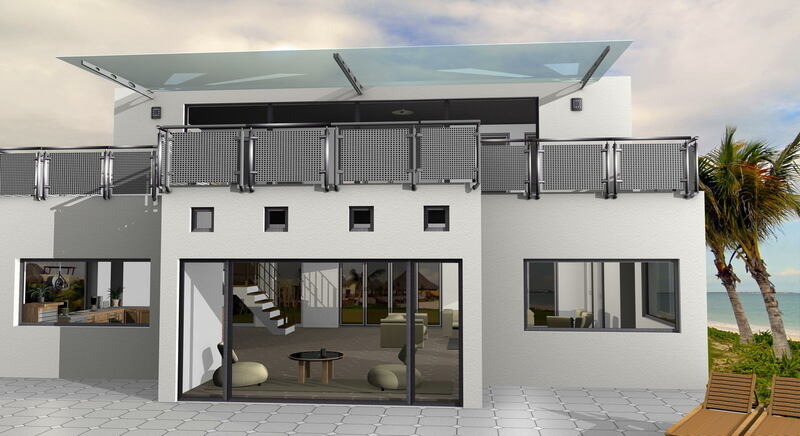 Roof windows can be positioned freely within a roof area using the mouse. 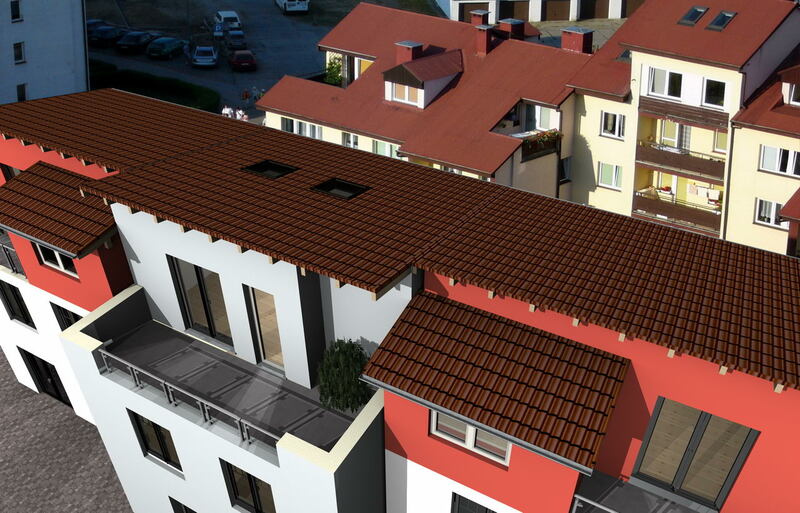 The calculated position of the roof window can be numerically adjusted with regard to the sill height and the opening height, in the properties dialog for the roof window. Putting in beams above or below a ceiling is like putting in walls, i.e. they join up and can be put in as a polygon or individually between two points. 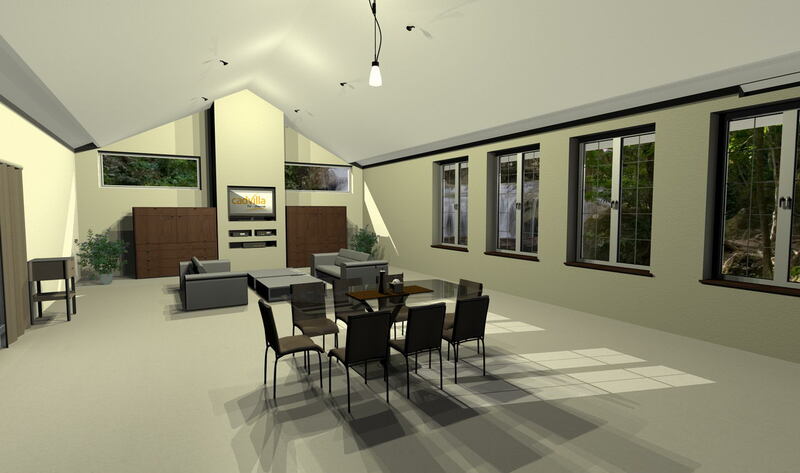 Beams below a ceiling are automatically placed underneath the ceiling; beams are placed on the ceiling structure and thus also modify the floor of the room. Apart from the width and height of the beams you can specify the line type for display, the material for the upper, lower and exterior surfaces, and structural layers. Supports can have a round or rectangular profile. Both forms can be positioned freely with a single mouse click. 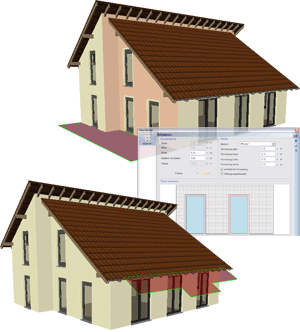 The dimensions of the support, the representation of its outline and the building material and its characteristics can be specified in the 'Properties' dialog. By default, supports automatically assume the height of the floor of the building and the level of the layer in which they are put in. Chimneys start on the floor in which they are put in and extend upwards through all upper floors and the roof. 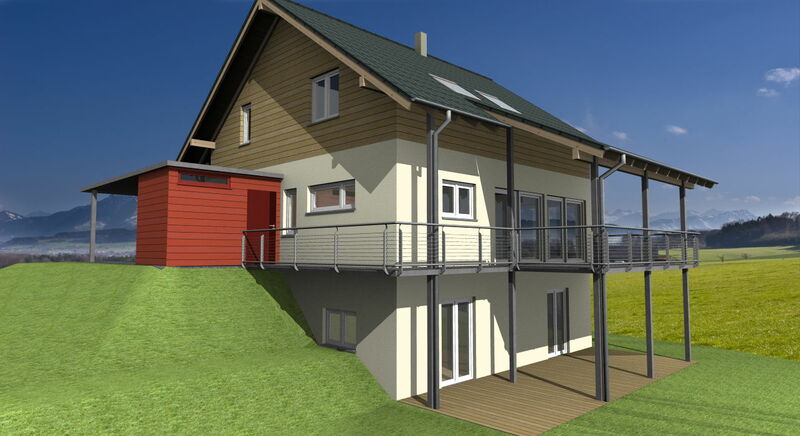 The option to change the height later either define an absolute height in relation to the floor where the chimney is located, or a relative height above the highest ridge of the roof defined for the current building. You can also define the absolute height for a chimney. Under structure you can specify the number and the dimensions of vents, as well as an option for ventilation. By default, the 2D display of the chimney in 2D top views depends on the shape of its 3D model. Other displays can be allocated using 2D symbols from the catalog. A display using a symbol is automatically scaled to match the absolute dimensions of the chimney. Extrusion solids are created from a closed 2D contour, for which an additional height is defined. There are two ways to define a 2D contour. - By manually putting in a closed polygon. - By using an existing contour (e.g. of a 3D object or one from the 2D symbol catalog). Using manual input, a 2D contour can be defined in the top view, in a sectional view or in the 3D view. Extrusion solids are true solids with which Boolean operations can be performed, and that can be merged with other solids. Rotation solids are created by a 2D contour revolving around a specified rotation axis. Surfaces are generated along the contour to form the solid. This is illustrated by the following examples, which all show, from left to right, the 2D contour, and the result after rotation in a sectional view, and the resulting solid. The rotation axis is defined by the input of two points. You can generate different 3D objects from one 2D contour by segmenting and due to the rotation axis. Our example shows a plant pot - on the left the contour, in the middle after rotation with 24 segments, and on the right after rotation with 4 segments. Sweep solids result from 'sweeping' a contour along a predefined path. The 2D contour can be freely defined or selected from over 120 predefined contours and profiles. The path can be defined in one of three ways. - Polyline: A polyline produces a sweep solid which is 'open' at the start and end, and which can be used to create, for example, baseboards in a room which cannot form a closed solid since they start and end on either side of a door frame. - Polygon: A polygon produces a closed solid in which the end points meet and which can be used to create, for example, ceiling moldings at the junction of wall and ceiling. - Contour/path: This function produces a solid which follows a contour or path made up of 2D elements. Several individual 2D elements must first be combined to form a contour. This option is useful for producing, for example, a path consisting of lines and arcs, as would be required to create a drainpipe. 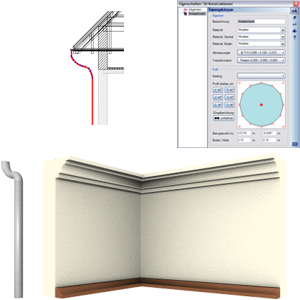 Typical applications for sweep solids are, as shown in our example, downpipes, baseboards and ceiling moldings. Images and 2D Elements can be scaled very accurately. 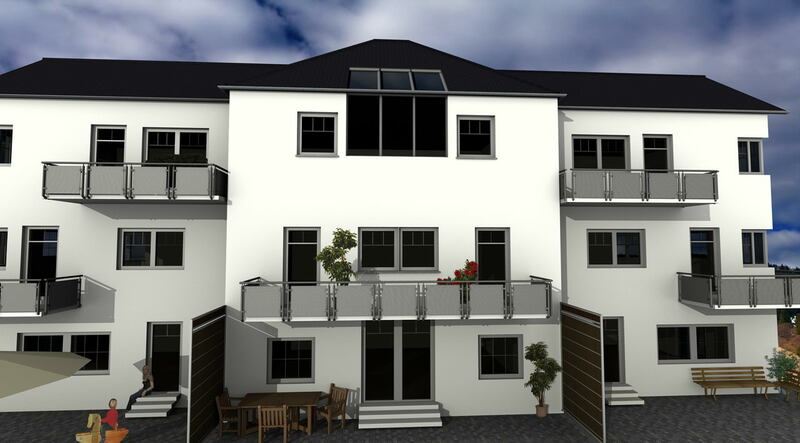 This allows images of floor plans to be added in and used as a 'blueprint' on which the 3D model of the building can be constructed. 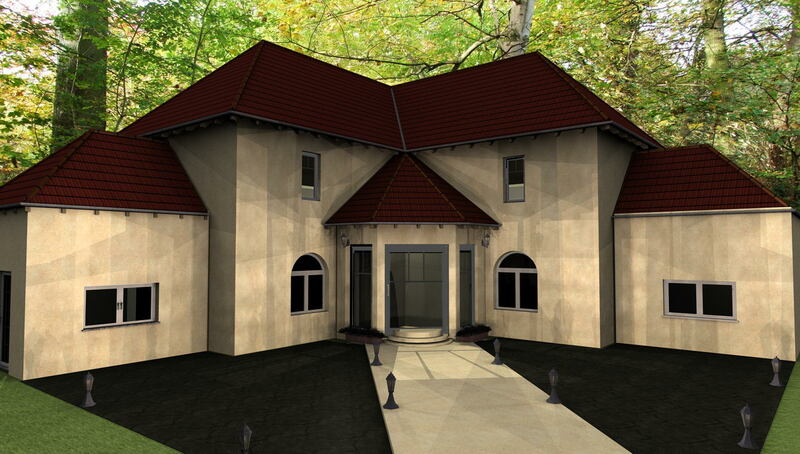 The procedure for creating a 3D model is quick and easy. Load the image from a JPG, BMP, PNG or GIF file. The image must be scaled to the correct dimensions, as undefined dimensions and incorrect proportions can often result during input. You can achieve this by putting in a reference dimension which is defined by specifying two endpoints in the image. Then a dialog box will appear that shows the current measurement while allowing for a numerical input of the actual value. After exiting the dialog the image is scaled to the new dimensions. 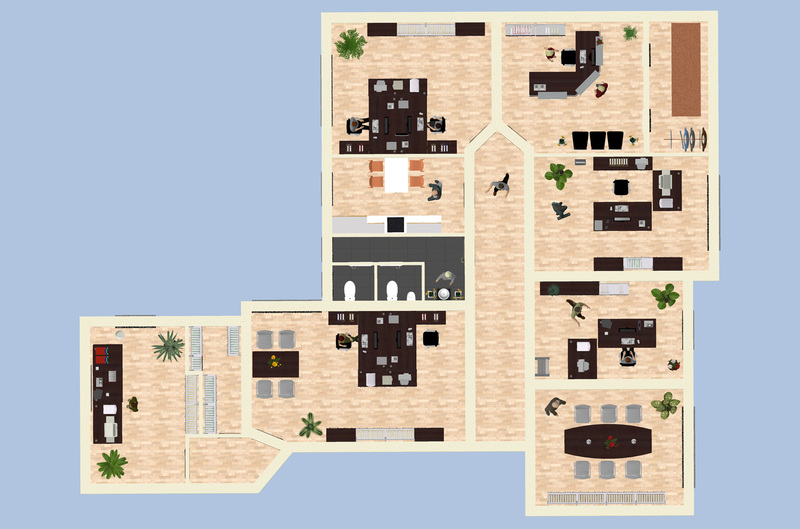 You can now start with the input/blueprint of the floor plan. 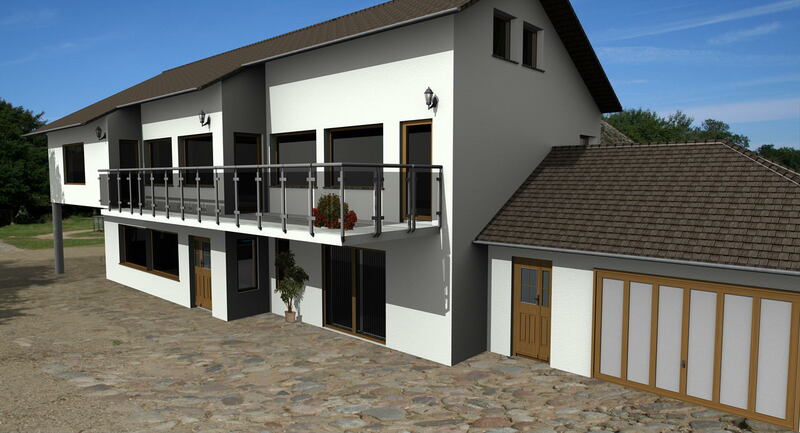 Measurements for wall thicknesses, windows and doors can be taken directly from the inserted image using the measuring and dimensioning functions provided. 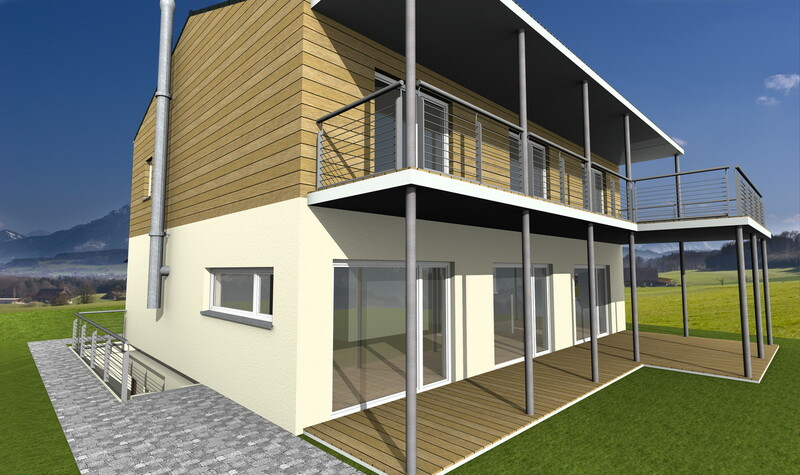 Construction components such as walls, roofs and floors, contain structural layers with their own properties. By default, for each of the components mentioned above, at least one layer is always defined. You can create other layers created and modify their properties. You can specify a name for each layer, the thickness, the building material, a layer separator and the location of the layer within the structure. Multi-layered structures which are frequently used can be saved in the provided folder for future use in other projects. Once you have defined a wall, it is shown in the 2D view with the appropriate fill patterns, layer thicknesses, hatchings, colors, font sizes and line types. 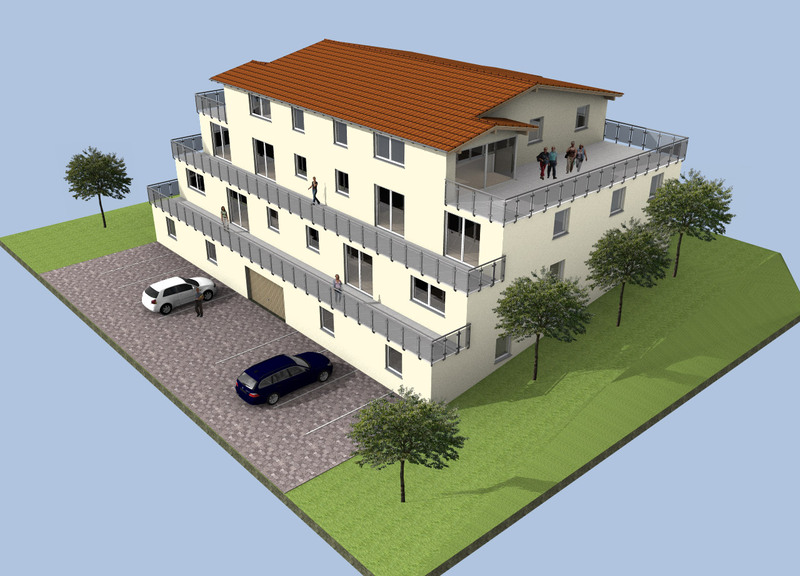 This function provides a colored display of living space in 2D and 3D views according to the German living space ordinance and the DIN standard 277. The floor areas are shown of course at the particular height. 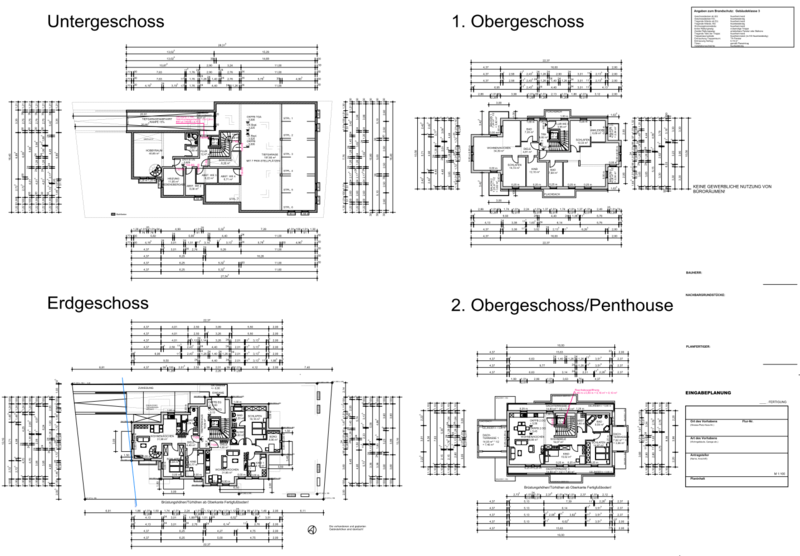 The floor plan can be represented in 2D or 3D and is a great help in documenting the calculation of living space according to the DIN standard 277 or the German living space ordinance. This function provides a colored display of quantities in 2D and 3D views. With the help of the 3D converter you can convert 3D objects in other formats and edit them for the use in the object catalog or in other modules. The converter provides various functions for editing objects, which partially depend on the original format. 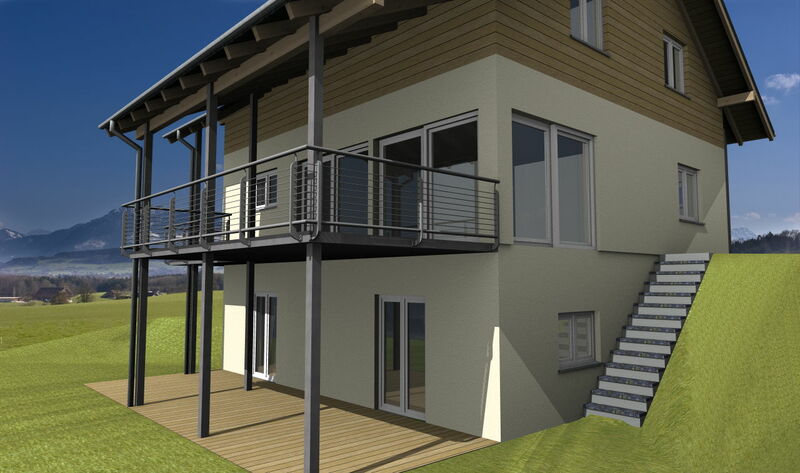 The software differentiates between single, multiple and height dimensions (for sectional views and other views). The settings for a dimension, regarding type, style and text can be modified for an existing dimension, or during input for all following in the properties dialog for 'Dimensions'. 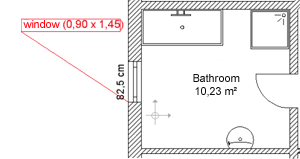 - Measurements greater than 1 meter are shown in meters with 2 factional digits. Values that follow in cm which must be rounded to 5 are denoted by a 5 in superscript. - Measurements less than 1 meter are shown in cm. Values that follow in mm which must be rounded to 5 are denoted by a 5 in superscript. The function 'Copy Properties' is provided to change the settings for several or all dimensions later. The 3D dimension types are available in all 3D previews shown in dialogs. However, here they serve more as a measuring device, since the dimensions are lost when the preview or the dialog is closed. When creating 3D auxiliary lines, the current position is shown by a 3D cursor, which snaps to surfaces, edges and corners. In order to help create auxiliary lines relative to axes, and for all straight auxiliary lines, the line itself is displayed directly. During input, the current values such as angle and distance are continuously updated at the measurement line. A left mouse click terminates the measurement process and the result is shown in the plan, until another measurement is performed, or the measurement function is terminated with ESC or via the context menu. 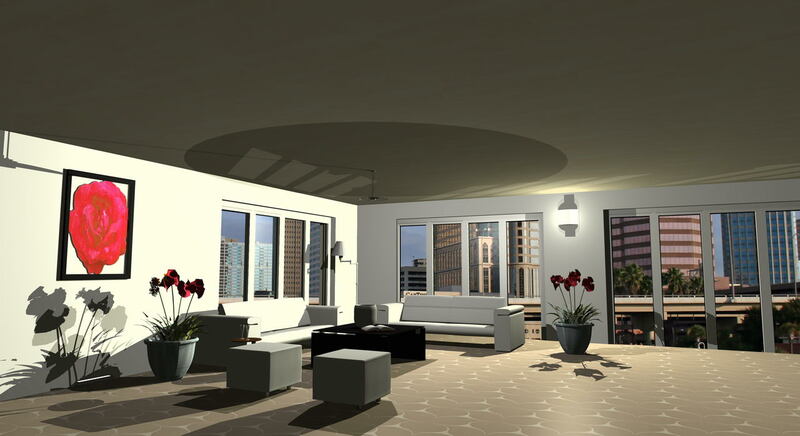 For each floor of the building the software automatically creates a ceiling over the first exterior contour of connected rooms. In some cases automatic ceilings are not necessary or desirable. Therefore they can be deactivated for one floor in the properties dialog of the particular floor. 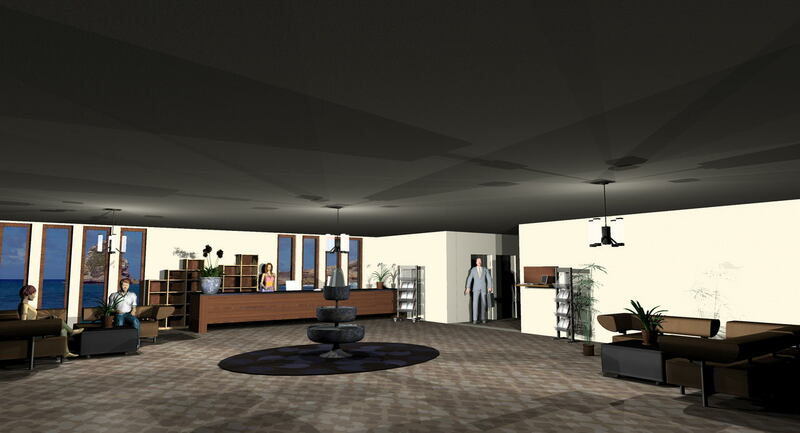 Additionally, the creation of an automatic ceiling can be turned off when a floor is copied. In addition to automatic ceilings, ceiling slabs can also be inserted using a rectangle or polygon. As with all construction elements, structural layers can also be defined for ceilings. With the help of these functions you can add additional details such as lines, polygons, rectangles, circles and ellipses to 2D views, i.e. top views, sectional views, views and parallel perspectives. This enables you to add planning details to your drawings for the specification of for example sanitation and electrical installation. The elements used in the 2D graphic editor, i.e. lines, polygons, rectangles, circles and ellipses, have various properties for display which can be defined in the corresponding dialogs and which include the thickness of lines and borders as well as properties for edges and fill patterns. Item text can be used to label elements (for example, windows, 3D objects and walls) by positioning a text with a line connecting it to the selected element. If several elements overlap, a particular element can be selected over the context menu. All properties of an item text such as the content and style of the text can be changed, if necessary, in the dialog which is activated by double-clicking on the item text or via the context menu available for a selected item text. This feature allows you to enter your own text in views, or to load and format text files. Furthermore, you can specify an angle for the complete text block. The autotext feature provides placeholders for values which change from one project to another such as project name, name of planner, etc. 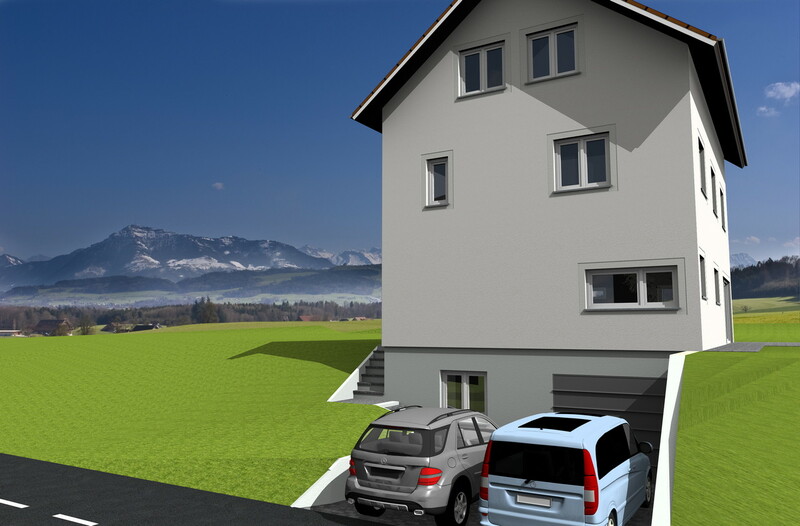 The autotext placeholders provided consist of the properties of the views such as name and scale and the project properties, for instance names, addresses and remarks for the planned building, the planner and the client. Using the autotext feature and the save text function, you can create text blocks for the use in future projects without having to change project related values manually. Using 2D symbols and the standard graphic functions, other applications, such as titles and legends are also possible. 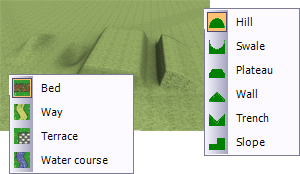 The software provides a range of predefined landscape forms such as hills, declines, plateaus, ridges, gutters and slopes to allow you to shape the terrain. Suitable dialogs are provided for putting in the various terrains. Other landscape features can be incorporated as well. 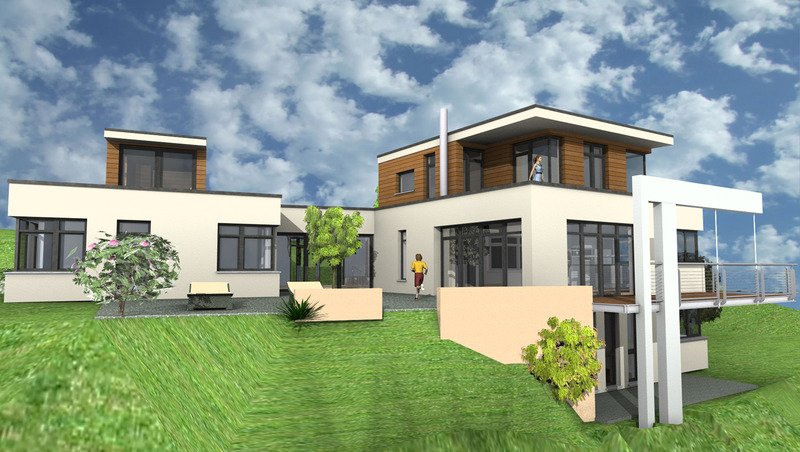 The available features here are flower beds, paths, terraces and waters. 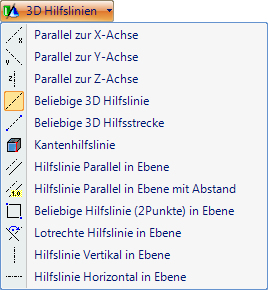 Here you are supported by adjusted input dialogs – thus, paths can be put in polygonally or in the shape of splines. Landscape features automatically adjust to the contour of the terrain and the terrains defined. 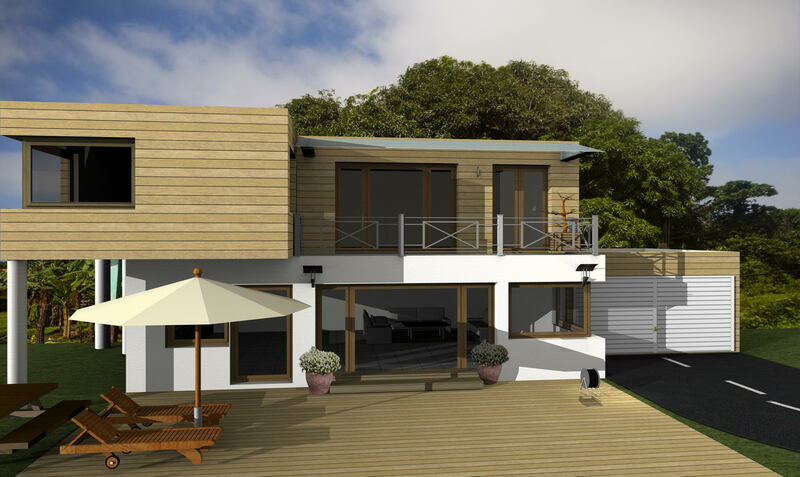 Shown below are a few examples which were created with the cadvilla architecture software. To enlarge one the following images simply click on it. To close the window which is then opened, simply click on close window . When an image is enlarged, you can also browse the next or previous images using the arrow keys.